Like some humans, older dogs can exhibit signs of senior dementia. Vocalizing (barking, growling, howling) for no reason or at all hours, appearing to get "lost" in familiar surroundings, and other personality changes may suggest dementia. While there may be some treatments that can slow the progression, dementia is not curable. 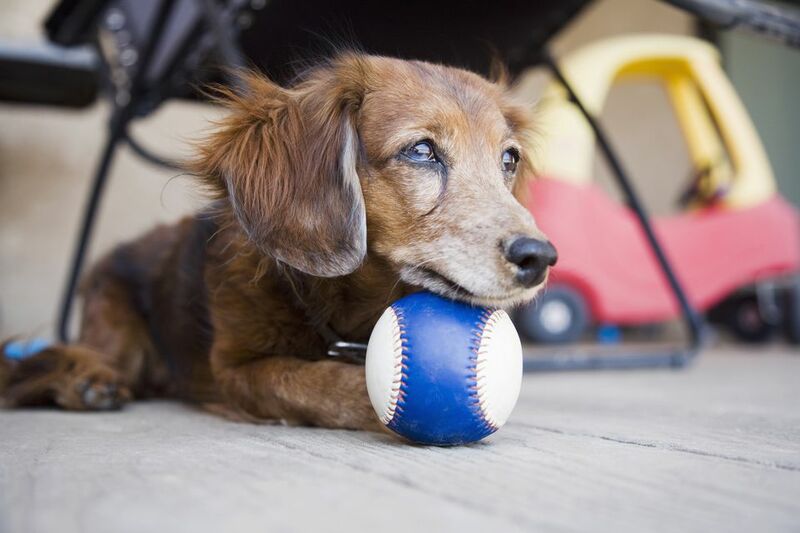 Also known as canine cognitive dysfunction (CCD) or cognitive dysfunction syndrome, this condition affects a significant portion of the senior dog population. While there are actually four cognitive forms, the general understanding of canine cognitive dysfunction is an age-related neurobehavioral syndrome. It leads to a decline in cognitive function. This decline may vary in its timeline but can be devastating to the dog-human relationship and often requires a lot of care. Why Do Dogs Have Dementia? Dementia or CCD is caused by physical changes in the brain and its chemistry. Studies have determined that some older dogs develop brain lesions similar to those that are found in patients with Alzheimer's. As a result, you might observe deterioration in how your dog learns, thinks, and remembers, and these behavioral changes can impact the lives of both you and your dog. A large percentage of dogs, ages 10 or older, experience dementia, which includes a range of symptoms like confusion and disorientation. It's always important to have your pet evaluated by your veterinarian to rule out any medical causes first, as some diseases may involve signs or behaviors that are similar to those of dementia. A treatment plan can be put in place by your vet that often includes behavioral management, environmental management, diet, and medication. The purpose of the treatment plan should be to slow the progress of the disease and improve (or maintain) quality of life for both the dog and the owner. Some examples of management techniques could be spending more time playing during daytime hours; dog-proofing the house (much as you would for a toddler); providing proper toileting care, including pads or even doggie diapers; and adding antioxidants to your dog's diet or feeding it specialized senior care food. Many dogs that are suffering from CCD experience some level of anxiety. It can be stressful if they awaken and feel alone in the middle of the night or find themselves in the corner of a room and can't remember how to get out of that spot. Managing anxiety can be dog specific, but could include soothing music, long walks, petting, or even aromatherapy. Your veterinarian will also discuss prescription options for your dog. You can inquire about Anipryl, a drug used for some cases of dementia. Inform your vet about any dietary supplements your dog is taking before starting any prescriptions. Some may have negative interactions. There's no way to prevent CCD in dogs. Medical research is constantly working on this condition as it affects so many dogs (and could have a medical impact on Alzheimer's cures). As your dog ages, maintain a healthy diet, an active lifestyle, and include mental and physical stimulation to help stave off CCD. Diagnosing CCD can be tricky. Each dog exhibits its own distinct symptoms, which may come and go. Since the symptoms can vary and may not be present at all times, a proper diagnosis may be difficult to come by. A vet will likely run a number of tests based on the dog's symptoms. If these tests reveal no other medical cause, the vet may diagnose CCD. There's no specific CCD test that can provide a definitive answer for pet owners.